Freedom fighter, Kasturba’s teacher, Padma Bhushan and greatest contributor in the field of tribal girls education, ‘Didi’ of tribal Dang district Purnimaben Pakvasa completed 100 years of her life today. Pakvasa has been working for empowerment of tribal women in the hilly region of tribal Saputara in South Gujarat for the last five decades. So far, more than 7,000 tribal girls of the Dangs and Surat districts, have been educated in Pakvasa’s Ritambhara Vishwa Vidyapith at Saputara. Her ‘Shakti Dal’ formed in early 1950s, has so far trained over 26,000 tribal women across the country. Inspired by Mahatma Gandhi and Kasturba during freedom movement, Pakvasa not only believes in empowering women for overall development but also advocates physical training to make them strong. Like her father and uncle, Pakvasa, went to a military college in Amreli and learnt flying aircraft flying in Nagpur. Pakvasa first met Mahatma Gandhi at Ranpur when she was just eight years old. 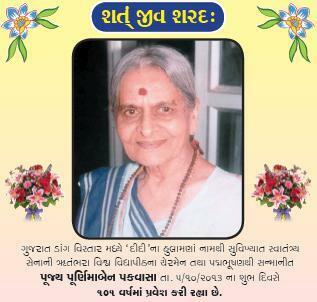 She took part in ‘satyagrah’ at Limdi and at Rajkot worked as a volunteer with Subhash Chandra Bose and helped underground Congress worker during salt ‘satyagrah’ in 1932. At 18, she was jailed for participating in the Dandi March. Her inmate in the jail was none other than Kasturba Gandhi, who was like a foster mother to Purnimaben. Kasturba trained Purnimaben in yoga, lathi charge and self-defence techniques. In return, Purnimaben taught Kasturba to read and write. Impressed by her intuitive teaching capability, Kasturba Gandhi asked her to teach other inmates as well. Thus Pakvasa’s fledgling teaching career began in the close confines of a stony prison cell. So far, thousands of tribal girls of the Dangs and Surat districts, have been educated in her Vidyapith run by ‘Ritambhara Gramin Vikas Trust’, but in initial days the challenge for her was to convince the Dangs (local tribals) parents to send their daughters to school. She would go door to door urging people. The school was started with only 15 girls. Pakvasa has been for multipronged approach for development of tribal women for the past several years. Not only she believes in empowering women for overall development but also advocates physical training to make them strong. The mother of dancer Sonal Mansingh, Purnimaben also has widely travelled the world and has been to Russia, Europe, Singapore, Thailand, Bangkok, Burma, Berlin. About ten years back, India’s then President Dr. APJ Abdul Kalam visited her school at Saputara.